From potential Brexit effects on Fintech to block-chain for crowdfunding: the 5th ECN Crowdfunding Convention is going to be an exciting one. 2016 is proving to be a hot year for crowdfunding and alternative finance globally. Brexit and its possible effects on crowdfunding, Lending Club’s scandal and its impact on P2P lending, the potential of block chain technology for crowdfunding are just a few of the discussions that shaped the first half of this year and will animate the 5th ECN Crowdfunding Convention. This high-level event, which is a reference meeting for the pan-European crowdfunding ecosystem, will gather experts and professionals from all over Europe to discuss these and many other topics. Recent estimates indicate that Alternative Finance in Europe has reached a volume of about €7 billion at the end of 2015, revealing and impressive growth rate for the market when compared to the previous year. The growth trend is not going to stop this year either, thus increasing the sector’s weight as source of early stage finance for European SMEs, startups and creative projects. More and more corporations, public organizations and financial institutions are acknowledging crowdfunding’s role in facilitating access to finance and are collaborating with platforms to create win-win partnerships or develop new models and applications. As crowdfunding develops further its roots within the ecosystem around it, the demand for enhanced professionalism, best practices and transparency increases. 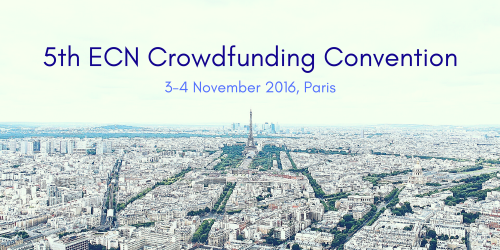 The ECN Crowdfunding Convention will provide the stage to discuss these topics, share worthy examples and contribute to set a baseline for a stronger and more transparent pan-European industry for the years to come. As ECN’s Executive Director, Oliver Gajda, explains “the ECN Crowdfunding Convention offers a unique opportunity to meet high-level stakeholders from the ecosystem: platforms, banks, policymakers, professional investors and many others. This is a must be event to develop a truly pan-European vision for 2017 and beyond, to learn from success and failure as well as to connect with international actors from the sector”. With 50 leading expert speakers and more than 250 participants this will be the game maker for European crowdfunding industry. World Efficiency, nous y étions !